Imprimis has published a lecture by Charles R. Kesler, editor of Clarement Review of Books, about “America’s Cold Civil War“. It’s worth a read, but Kesler’s rendering of the subversion of the Constitution is on the skimpy side, as is his analysis of options for a resolution of the cold civil war. For a more complete treatment of those and related matters, see my page, “Constitution: Myths and Realities“, and the many posts listed at the bottom of the page. Since 1968, the norm in America has been divided government: the people have more often preferred to split control of the national government between the Democrats and the Republicans rather than entrust it to one party. This had not previously been the pattern in American politics. 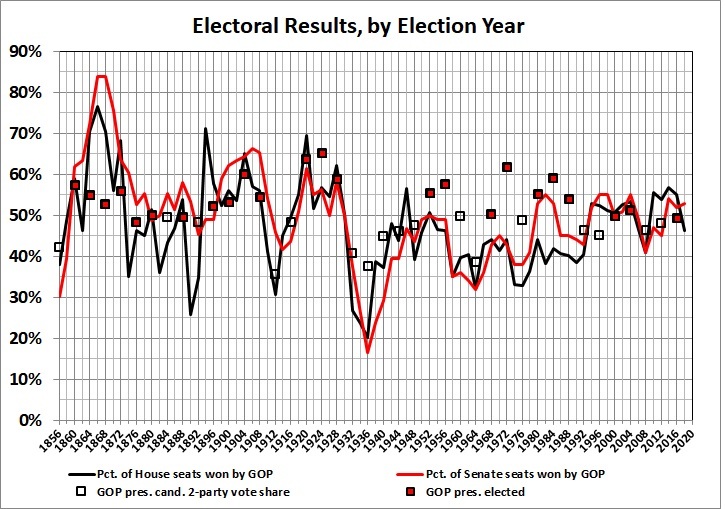 Prior to 1968, Americans would almost always (the exceptions proved the rule) entrust the Senate, the House of Representatives, and the Presidency to the same party in each election. They would occasionally change the party, but still they would vote for a party to run the government. Not so for the last 50 years. I decided to look at the numbers to see if Kesler has it right. In fact, the “norm” of divided government began in Eisenhower’s presidency. The GOP eked out a narrow hold on both houses of Congress in 1952, when Ike won his first term.. But the GOP relinquished that hold in 1954, and didn’t regain until 1994, during Clinton’s presidency. Since 1952 only JFK, LBJ, and Carter — Democrats all — enjoyed same-party control of Congress throughout their presidencies.